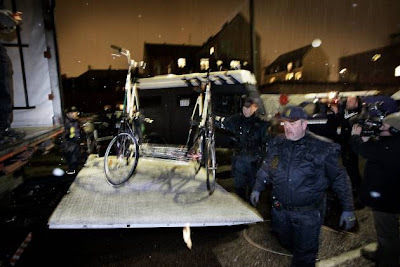 The police confiscated a number of so-called 'war bikes' last night, on the eve of one of the main demonstrations during the climate conference. They raided The Candy Factory, where the bikes were being prepared for the demonstration and... well... took them away. I blogged about The Bike Bloc a couple of weeks ago and it's a shame that the bikes were taken. The police say that they are illegal bikes and may be used illegally at the demonstration. The police spokesman, when pressed, couldn't answer in any detail what he thought the bikes could or would be used for. Via Politiken [in Danish] - and this article They're Taking Our Bikes!